Choose the best ingredients possible. Take time to enjoy your food. But of course, we all know that rules are broken. We will sometimes buy Timbits on a road trip. When we eat at Chinese restaurants, we don’t make a big deal about how the meat was raised. Sometimes we don’t want to share our food. I’ve been making homemade ice cream for the past few years and have to say I’ve made some really delectable ones. None of them have wowed me as much as this luscious honey-roasted apricot version. The apricots were roasted to drive off moisture and intensify their flavour while the honey is present but gentle enough to impart a sweet nuance without being overwhelming. Summer perfection. Sorry. I don’t think we’re going to share this batch. Nope. Gotta be a rebel and break the rules sometimes, you know. Halve and pit apricots and lay them cut side up on a parchment lined, rimmed baking sheet, drizzle with honey. Roast at 450 degrees F for 20 to 30 minutes or until apricots start to caramelize. Cool and reserve 2 cups and chill. Happily eat the rest. Combine honey and sugar in a medium saucepan. Over medium heat, cook until honey starts to bubble and sugar melts. Turn down heat and cook for about 5 minutes. Add cream, milk and vanilla bean and return to heat. Some of the molten honey will harden but will dissolve while the cream heats. Turn off heat and let mixture steep for 15 or 20 minutes. Meanwhile, lightly whisk eggs and salt in a heatproof bowl. Remove vanilla bean from cream and gradually whisk cream into eggs. Return the mixture to the pan. Stir and heat gently until custard is thickened and coats the back of a spoon. Strain through a fine meshed sieve and chill until very cold, at least 4 hours. 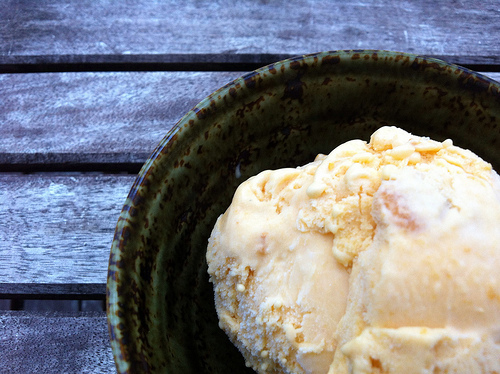 Combine with reserved apricots and churn in ice cream maker while pacing in anticipation. Transfer to an airtight container and freeze until firm. If you live with other people, stash container at back or bottom of freezer so no one notices it. Savour when no one is looking.